Review of Paul Weller Gig At The House Of Blues, Chicago! – Paul Weller News! Review of Paul Weller Gig At The House Of Blues, Chicago! 3 Comments on Review of Paul Weller Gig At The House Of Blues, Chicago! While many music acts from the ’80s are living off the fame grid, save for the occasional reunion tour or award show appearance, Paul Weller is still working hard. The former front man of The Jam and The Style Council has built a very respectable and varied solo career. 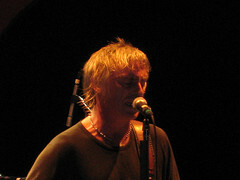 While his music is popular in Europe, Weller is virtually unknown in the States, despite his unique brand of soul-tinged rock. The crowd at the House of Blues last night was sizable (although not sold out) and for the most part looked like a crowd of middle-aged, well-dressed parents at a football game. Touring for his most recent album 22 Dreams (Yep Roc), Weller is incredible shape, jumping around onstage nursing drinks, and smoking (gasp! Are Brits exempt from the smoking ban?) throughout the evening. His energy matched his set, which covered his career reaching as far back as his days leading The Jam and lasted almost two-and-a-half hours. From the set’s opener “Peacock Suit” to the third encore, a cello-tinged cover of “All You Need is Love,” Weller’s vocals remained strong. The most delightful part of seeing him live is hearing extended, jam-length versions of his songs. “Wild Wood” had an intense, dub-heavy revision, and “Shadow of the Sun” took a trip into Thin Lizzy territory with guitarmonies between him and guitarist Steve Cradock (of Ocean Colour Scene). Despite how entertaining and rich his entire set was, the crowd was quiet the entire evening but briefly rallied for Weller’s best-known hits from the Jam’s era, “Town Called Malice” and “That’s Entertainment.” Many in the crowd, who were likely fans of Weller’s music when it debuted thirty years ago, were now in sport jackets and Dockers jumping up and down screaming in delight alongside Weller’s younger fans. As I stood next to a dead ringer for imprisoned former ‘N SYNC manager Lou Pearlman who was clapping his hands and dancing on the floor, I thought about a somewhat crass line that comedian Chris Rock has said: “You are always going to love the music you were listening to when you first got laid.” It seemed like “Malice” loosened up the self-consciousness of the audience, and despite however awkward it looked, people of all ages finally felt free to boogie, albeit for a few minutes. Weller smiled and danced around himself as the floor went wild for his famous chords. Maybe he had the same nostalgia on his mind, too. I guess Robyn and I were standing in very different places. At the bar the crowd was younger and moving and screaming…and drinking. Maybe that’s the difference 😉Excellent show. I read this review whenit was originally posted on Transmission, and I refrained from commenting, but given that this is a Weller blog, I just have to say . . . I was at the House of Blues on Tuesday and I completely disagree that the crowd was “quiet” or that we were waiting for the Jam hits (though they were fun when they came).It was my first time seeing the man, and it was one of the best shows of my life. I don’t think I was alone in that perception. I thought it was an excellent show.I have been a fan Paul Weller for nearly 30 years. Of course, I have my favorite tunes and whenever an artist of that stature plays, I want hear my favorite tunes. For instance, I was disappointed that he didn’t play “Sunflower.” I keep reminding myself: “He can’t play everything.” My job is not coming up with the set list; it’s to enjoy the concert. And Paul Weller certainly didn’t disappoint in that respect. Previous Entry Review Of Paul Weller Gig At The Trocadero In Philadelphia! Next Entry Paul Weller Plays Exclusive Gig For The BBC!